Teapot Rabbit – sewing, cooking, gardening, and copious amounts of tea. sewing, cooking, gardening, and copious amounts of tea. 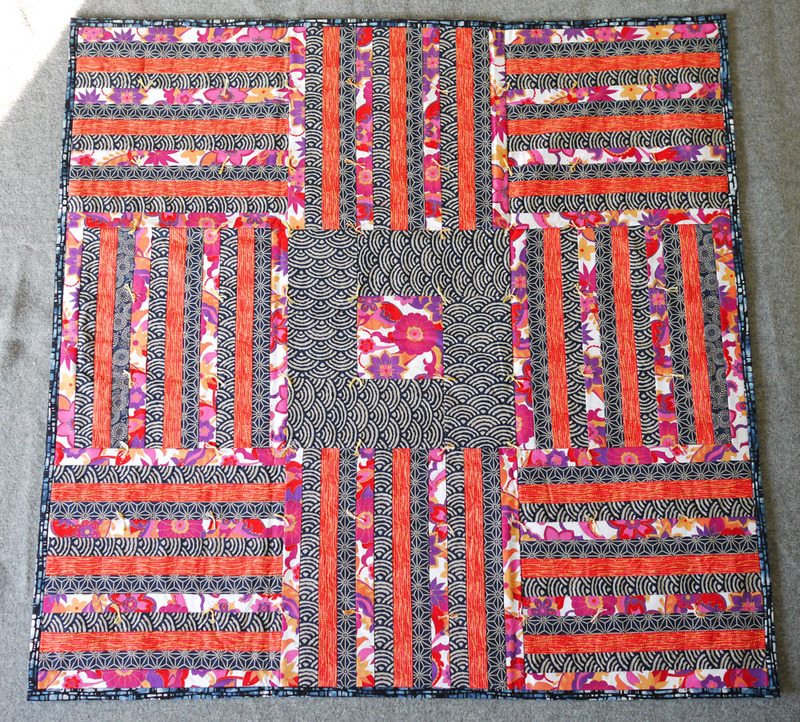 This was number two of three baby quilts I finished last year, and I still have one more half-quilted and another one planned. Too many babies to keep up with! My sister in law was due a month and a half after me, so of course I had to make her a quilt! The idea for this quilt came about because she showed me a picture of a blanket with cute cartoon solar system planets on it – and I went and did something completely different. Last year was joyous summer of babies in my extended family – one of my Irish cousins had a baby in May, followed by my own munchkin exactly one month later, my sister-in-law’s baby in late July. I was a little overwhelmed, and the Irish baby ended up getting his quilt last – I started it first, but I always forget how incredibly fussy the Meisen Maru block is, so I ended up setting it aside halfway through so I could finish my sister-in-law’s quilt in time for her baby shower, and then I had a baby… But I got it finished it the end! 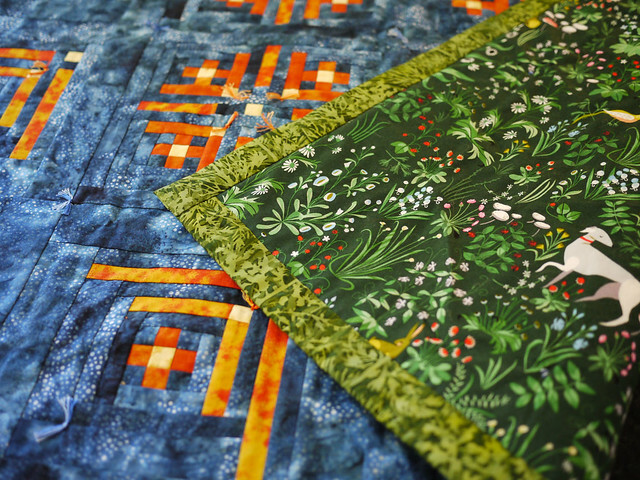 I wanted bright, saturated colors for this quilt, and I wanted to incorporate some kind of nature theme – my cousin loves the Irish countryside, her husband likes astronomy, and I have many fond memories of tromping along lanes, through coppices, and across the turlough with my cousins – so based on that, I came up with a design that, in my mind at least, incorporated elements of stars and greenery. This project happened because I found this delightful canvas on Miss Matatabi and decided I needed to do SOMETHING with it. 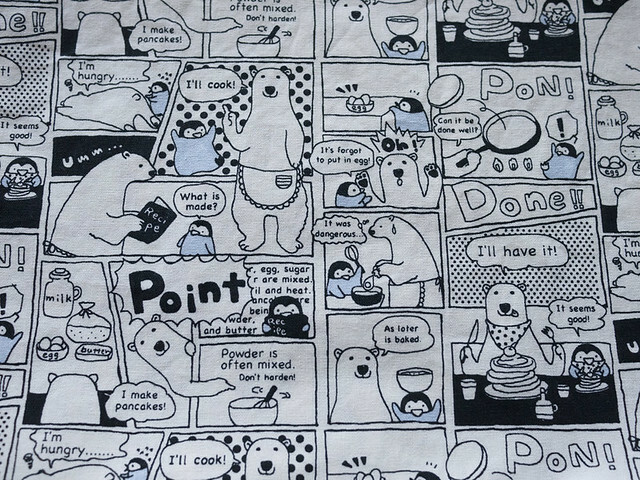 I mean, how can you possibly resist Polar Bear and Baby Penguin making pancakes? The slightly strange but still intelligible English only adds to the charm. 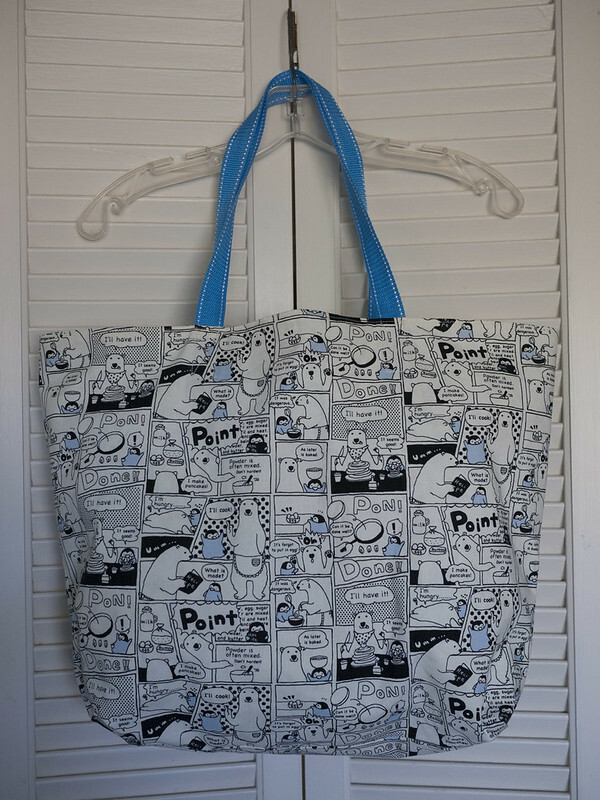 I decided to make a bag for a friend, who I knew would be equally delighted by the adventures of Penguin and Polar Bear. 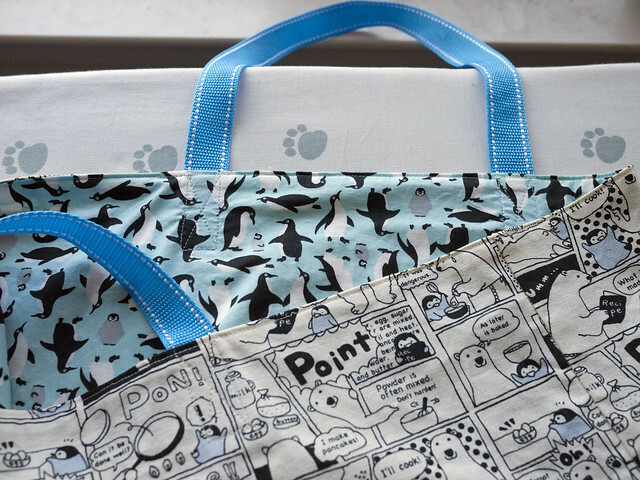 Luckily Miss Matatabi had a perfect coordinating penguin poplin to line the bag. Armed with half a meter of each, and some nylon webbing from the craft store, I made a bag. It’s lined and there’s a lot of topstitching to give it some body and keep the lining from flopping around, but other than that it’s really straight forward. 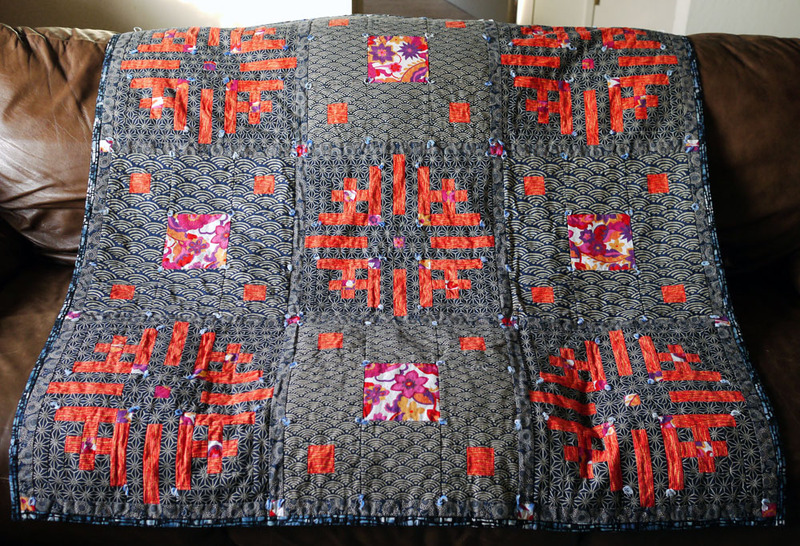 I have a backlog of quilts and projects to write about (what’s new?) and less time than ever in which to do so – but work is exceptionally slow and boring today, so let’s see what can be done. I think I finished this quilt a little over a year ago. It’s been entirely too long since I updated. 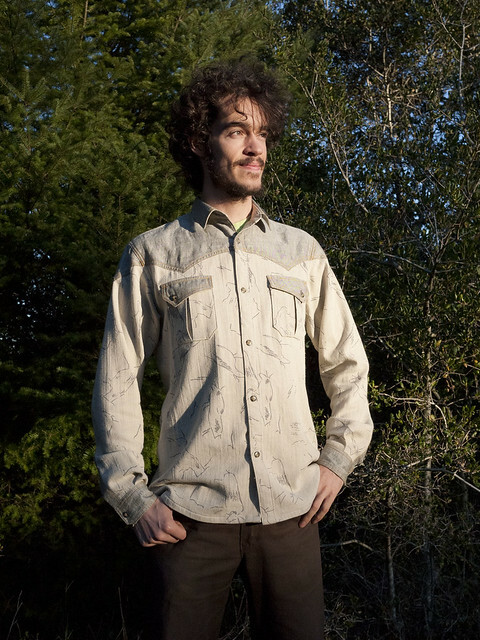 Case in point: The shirt I’m writing about I made for my brother for Christmas 2014. That’s a while ago. One of my cousins is a serious quilter, the sort who has quilts in books and thinks about hue and value and all that stuff when planning quilts. My approach to quilting is more freeform, shall we say? In other words, I change my plans partway through, add borders until it looks right, and generally make a colorful mess of everything. I have fun, though, and I think that’s the important part. More to the point, my quilting cousin organized a family quilting challenge some time ago. It was an informal affair – she sent us some fabric, and we had to use that fabric in a quilt somehow. The fabric in question was abstract coral and orange stripes, with yellow dots. It looked bright. Really bright. And yet… every fabric I set it against made it look lifeless and drab. I finally found a really bright floral cotton from Joann Fabrics in my stash that complimented my challenge fabric, and discovered that Japanese-style indigo prints provided contrast without dulling the bright colors. After that, everything proceeded to go wrong. I ran out of one of the indigo prints, found a replacement online, ordered it only to find that not only was the print a different scale, but the fabric was a vastly different weight. Then I ran out of the replacement fabric (foolishly having not ordered enough in the first place,) ordered more from the same place… and the scale of the pattern was off, again. 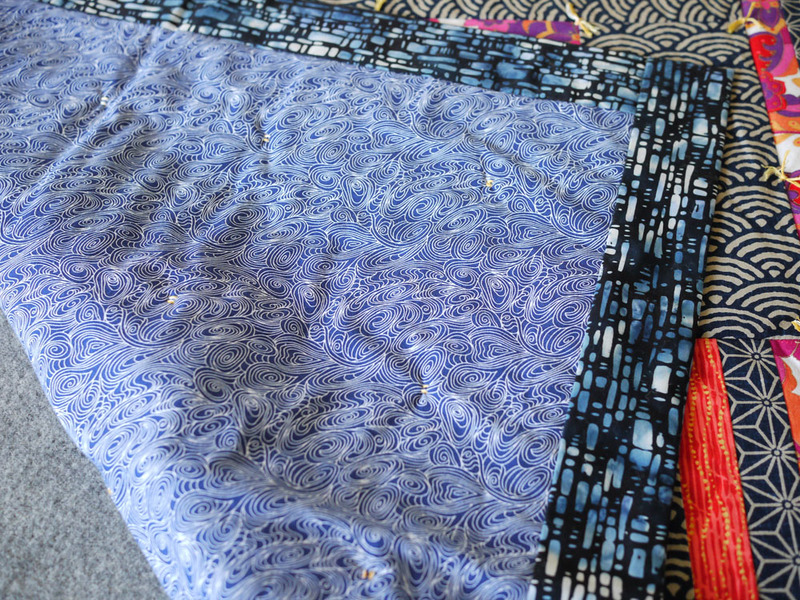 At that point, since I was running out of the challenge fabric, I said to hell with it, and finished the quilt – hence the slight discrepancy between the indigo fabric in the four square blocks. Block patterns: #18 Kurume kasuri masumon and #46 Meisen maru from Japanese Quilt Blocks to Mix and Match by Susan Briscoe. Not perfect, but done. I do like the color scheme, though I think I committed my usual mistake and made the blocks too busy. 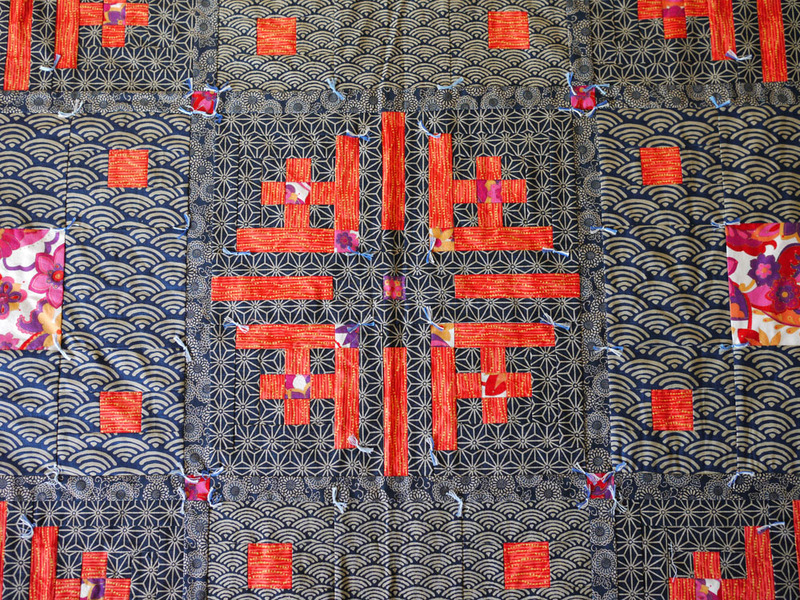 The Meisen maru blocks in particular could have done with a less busy indigo fabric, to really highlight the orange and floral fabrics. I don’t have a good photo of the back of this quilt, but it’s some bright blue and green tie-dyed skull and crossbones flannel from my stash, with some pieced indigo and floral accents. Very fun, and snuggly. 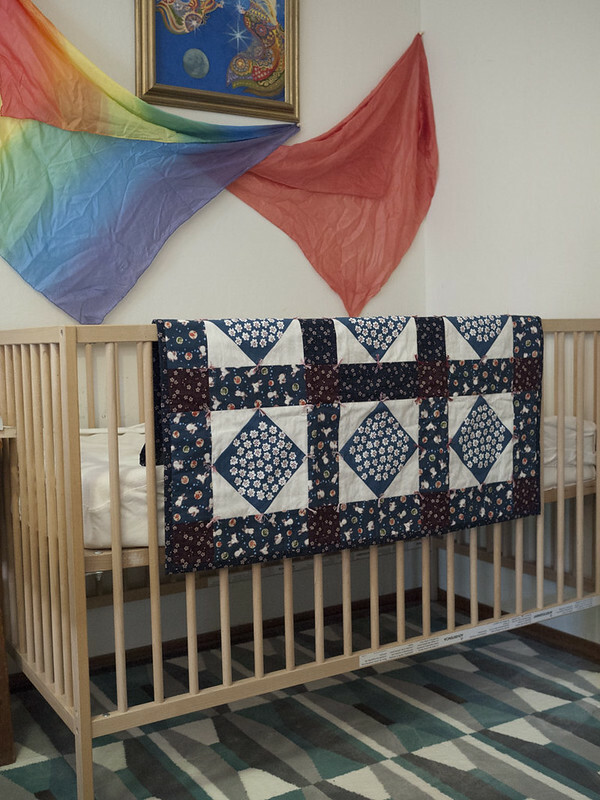 I originally meant to piece a back for the quilt from scraps, but after some more frustration – like coming up ONE STRIP SHORT of nine striped blocks, argh – I gave up and made a baby quilt instead. Not much to say about this one other than that I am inordinately fond of it for how simple it is. I had just enough of this pretty abstract wave patterned cotton to back the smaller quilt. Small triumphs, and all that! The backing, batting, and binding for both quilts was all scrap or stash materials, which was very satisfying – goodness knows I still have more fabric than I can fit in my storage containers, but slowly, slowly I shall whittle it down. There’s really not much to say about these muffins, other than that they’re delicious. I meant to post this back during blueberry season, when my mother gave me fresh blueberries that she’d picked at a local-to-her patch, but then I didn’t. Such is life. I made this recipe twice in as many days, because they were so good the first time my husband, father, and I ate them all – and then naturally I had to make another batch so my mother and mother-in-law could have some. 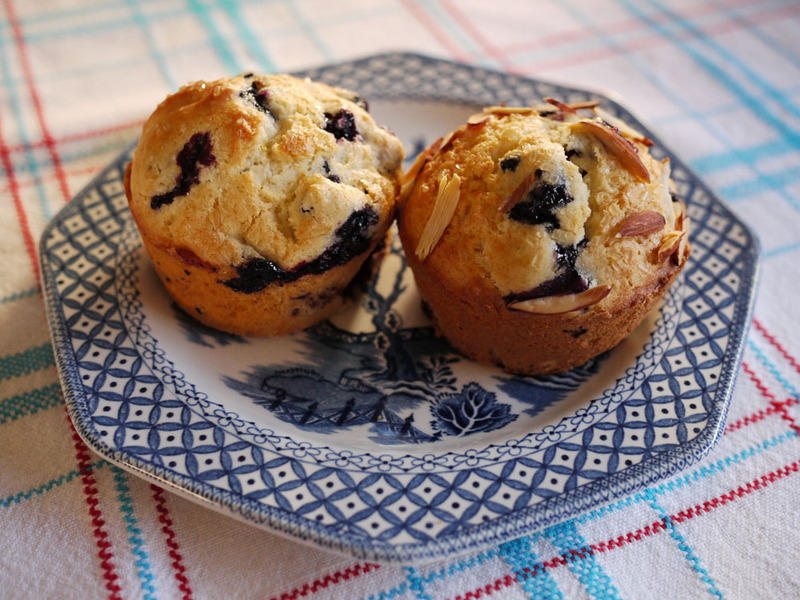 Though I baked them both with and without sliced almonds sprinkled on top, it was generally agreed that the addition of sliced almonds improved the muffins. Preheat the oven to 400°F. Grease 12 muffin tins. Cream together butter and sugar. Add egg, and mix well. Zest half a lemon into the butter mixture. Sift together flour, baking powder, and salt. Add vanilla and almond extract to milk. Add flour mixture to butter mixture in thirds, alternating with the milk and mixing well after each addition. Gently fold in blueberries. 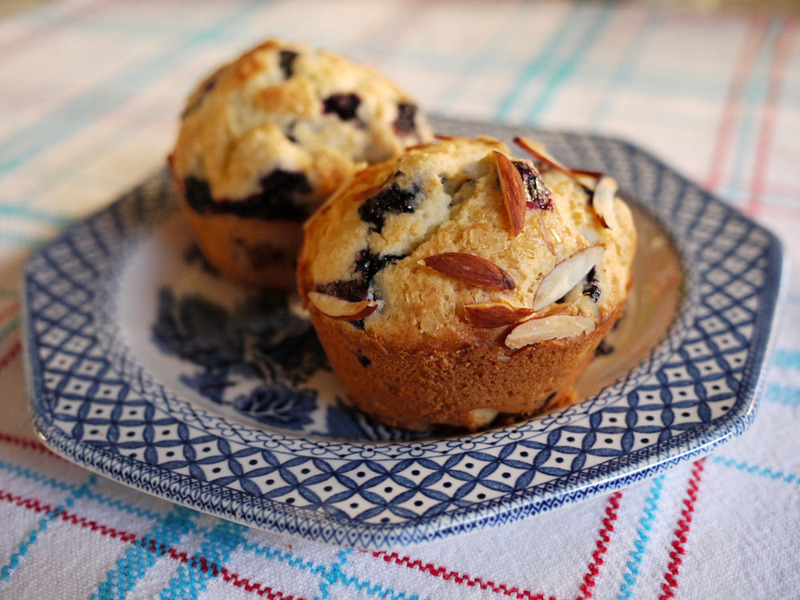 Portion into muffin tins, sprinkle with demerara or turbinado sugar and sliced almonds, and bake for 20-25 minutes. Cool in the muffin tins for a few minutes before removing muffins to a cooling rack. Raspberry blossoms in my back yard! I found a baby Western skink in the field! It tried to escape the camera by running up me, and ended up in my hair. 😂 I was delighted! The skink was less delighted, but was released unharmed.